Welcome to my weekly fashion blog post. Each week I will discuss a female garment, fashion trend or influencer from the age of photography (1840s through the 20th century). My goal is to educate family researchers and genealogists about the clothing worn by our ancestors. Dating photographs is an issue we all struggle with as family archivists. Additionally, anyone who writes about their family’s history should be aware of the environment in which their ancestors lived. Period clothing is an important part of that environment from how it affects a person’s movement to their overall lifestyle. This week I introduce you to the pagoda sleeve. While the term pagoda sleeve has been used to describe any funnel shaped sleeve, this week we will look specifically at the sleeve worn in the 1850s and into the mid 1860s. The pagoda sleeve of this period was narrower at the shoulder, and very wide at the wrist. Often an undersleeve was worn under the outer pagoda sleeve. The undersleeve would have been of a lighter weight cotton or linen fabric, matching the bodice’s chemisette or collar. As the Civil War advanced the pagoda sleeve was replaced by the bishop and bell sleeves. A bell sleeve appears to have been very similar to the pagoda sleeve [in fact I have seen the terms used interchangeably]. By 1864, the term pagoda sleeve had disappeared from the fashion plates. There appears to have been a brief revival of pagoda style sleeves in the 1870s, although not quite to the size (width) in the 1850s. A variation of the pagoda sleeve during the 1850s was constructed of layering tiers. A brief overview of the clothing of the 1850s and 1860s from Illinois State University. The book Clothing Through American History: The Civil War through the Gilded Age, 1861-1899 by Anita Stamper and Jill Condra discusses the Pagoda sleeve and many other 19th century fashions. While the book is available for sale on Amazon, it is rather pricey. It can be searched on a limited basis through Google books. I found a new online resource from the Chester County (Pennsylvania) Historical Society. They have a small collection of clothing on their website. Anita Stamper and Jill Condra, Clothing Through American History: The Civil War through the Gilded Age, 1861-1899 (Santa Barbara: Greenwood, 2011), 96. Priscilla Harris Dalrymple, American Victorian Costume in Early Photographs (New York: Dover Publications, 1991), 16. 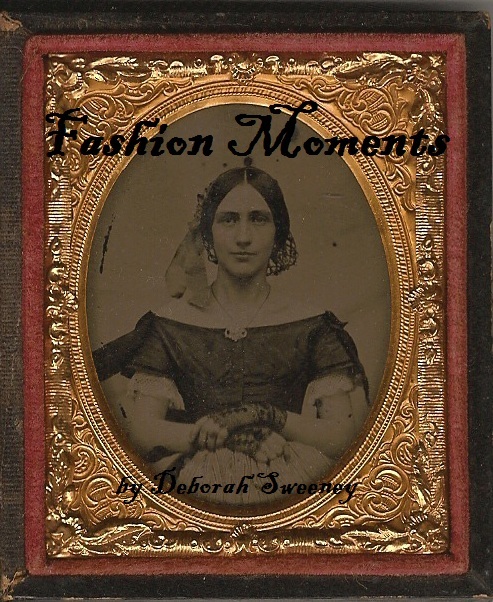 This entry was posted in Fashion Moments, Photography and tagged Civil War fashion, dating photographs, fashion, pagoda sleeve, Photography, sleeve on August 9, 2015 by Deborah Sweeney. The drawbacks mentioned by Melanie….maybe that’s one reason women gave up on them. Pretty, but not so practical. As a novice on this topic, an outsider, I am amazed that there is so much available in terms of books and resources. I can only imagine these sleeves dragging through dinner – but they are pretty! I agree! I keep thinking they had better have a maid because you couldn’t do any work in them.